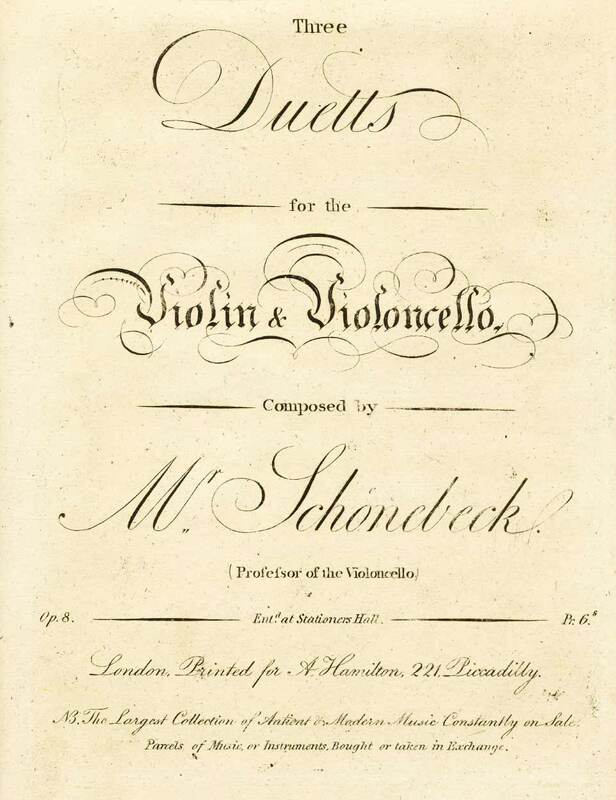 Schönebeck: Three Duetts for Violin and Cello, Op. 8, No. 1 in D Major, No. 2 in E-flat Major and No. 3 in A Minor. Set of three, facsimile of edition ca. 1800 (parts only) and modern performing editions, scores and parts. Karl Siegmund Schönebeck (1758 - ?) took up the cello when he was 18. He had various town musician appointments, and was active in Leipzig. He wrote several concerti, operas, and Three Duetts for Violin and Cello, Op. 8, published ca. 1800. He is not listed in NewGrove or MGG. First movements of all three are sonata form. Duett No. 1 has the only a slow movement in the set, an Andante. Finales of No. 1 and No. 3 are Rondos, while that of No. 2 is another sonata form.